NOTE: This posting thread was deleted from the forum -- ILL Posted on www.findstacypeterson.com by "DetHead" Full Member, Posts: 641 on thread titled, "Suds Pub" on: December 17, 2007, 09:09:37 PM, Quote, "Anyone familiar with this Pub formerly in Montgomery,ILL? Or the listed person? This is an actual pub, shown on the KS hand written will as assets. This is 1987/1992." "Village Atty. James R. Edwards has recommended revocation of the liquor license for Suds Pub, where a bartender allegedly awarded free drinks to a patron for winning at a video card-game machine. Mayor Gary Pregel, in his capacity as city liquor commissioner, recently found that Suds Pub proprietors violated the liquor code in three instances. 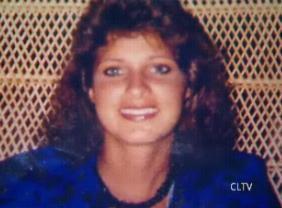 The alleged violation involving the video game occurred on Aug. 23, 1993. Pregel also ruled that Suds violated the liquor ordinance by not reporting an Oct. 25 alleged fight to police and by allegedly serving drinks to a 20-year-old on Jan. 10. But Suds owner Drew Peterson said that no one ever has been given free drinks for winning at the bar's video games and that the bartender reported the Oct. 25 fight after he broke it up, but not soon enough to satisfy village police. He admitted that a minor was served on Jan. 10, but said the penalty for that should be minor. "(The bartender) screwed up, and subsequently she was terminated," said Peterson. Peterson said the previous mayor issued Suds a commendation for not getting caught in a Police Department sting in which police sent minors in bars asking to be served. Pregel said he would decide by Friday what action to take against Suds. Penalties could range from a fine to revocation of the liquor license. The bar can delay implementation of any penalty by appealing to the state Liquor Control Commission." "Village President Gary Pregel, in his capacity as Montgomery liquor commissioner, has ordered a three-week suspension of the liquor license for Suds Pub. In addition, Pregel fined Suds Pub $3,000, or $1,000 for each of three alleged liquor-license violations. Attempts to reach Suds Pub owner Drew Peterson for comment were unsuccessful. According to Pregel, a bartender at Suds Pub on Aug. 23, 1993, awarded free drinks to a patron for winning at a video card-game machine. Pregel also ruled that Suds Pub, 1250 S. Broadway, violated the liquor ordinance by not reporting an Oct. 25 fight to police and serving drinks to a 20-year-old patron Jan. 10. Before Pregel ordered the suspension, Peterson said that no one was ever awarded drinks, that the bartender who served the underage patron was fired and that police were called after the fight, but not soon enough to satisfy village officials. Pregel ordered that Suds Pub be closed from Thursdays through Sundays starting Aug. 15 and ending Sept. 19. If Peterson appeals the order to the state liquor commission, the penalty would be delayed until it heard the case. 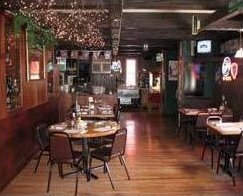 Suds Pub also had violated its liquor license in 1993 and 1989, according to Pregel's order." 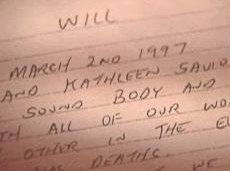 Suds Pub is mentioned in the WILL ILL "This day March 2nd 1997 Drew Walter Peterson and Kathleen Savio Peterson, both being of sound body and mind, do hereby bequeath all of our worldly possessions to each other in the event of either of our individual deaths," begins the will filed with court documents. 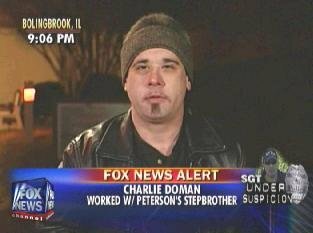 If they died together, the couple wanted everything to go to certain people, among them Tom and Kris Peterson, their children, and Eric Drew Peterson and Stephen Paul Peterson, Drew Peterson's children from another relationship. 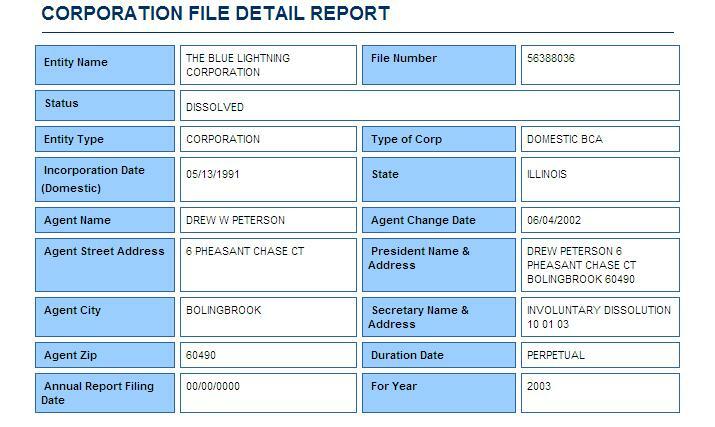 The will lists some of their assets:"
• A quarter interest in CMYK Corp., listed as a printing business in "Lombard-Naperville"
"26-year-old Aurora man was being held Monday in lieu of $50,000 bail at the Kane County Jail, two days after being arrested on suspicion of discharging a handgun in a tavern restroom, police said. Carl A. Armstrong of 832 Watson St. was charged with unlawful use of a weapon by a felon, not having a firearm owner's identification card, reckless discharge and theft by possession. He was arrested early Saturday at Suds Pub, 1250 S. Broadway Ave., after police were called to investigate a report of a man with a gun. Anderson allegedly was playing with a .38-caliber semiautomatic handgun in the restroom and accidentally discharged it, police said." "A pizza restaurant faces a three-day liquor license suspension this weekend because it sold alcohol to minors twice this year, Montgomery Police Chief Dennis Schmidt said Monday. 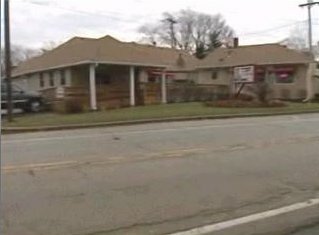 Pizza Hut, 1890 Douglas Rd., will not be allowed to sell liquor on Friday, Saturday and Sunday under an order issued by village President Ellis Van Meter, who also serves as liquor commissioner. The order results from an Oct. 3 investigation in which a minor working undercover for police bought liquor from Pizza Hut, the second time the restaurant sold to a minor during a sting operation this year, Schmidt said. After the earlier violation, the restaurant was fined $350, he said. During the Oct. 3 sting, minors were sent to all 16 village businesses with liquor licenses, and five sold liquor to minors, compared with six during a sting conducted in May and June, Schmidt said. 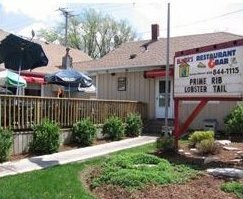 Other violators, all of which have been fined $350 and ordered to pay $125 in administrative fees, were Gario's Pizza Villa, 815 Montgomery Rd; Bill's Restaurant, Union Street and Montgomery Road; White Hen Pantry, 2 S. Lincolnway; and Suds Pub, 1250 S. Broadway Ave., Schmidt said." NOTE: This posting thread was deleted from the forum -- ILL Posted on www.findstacypeterson.com by "resolution" Jr. Member, Posts: 144, Re: Suds Pub, Reply #33 on: December 17, 2007, 11:44:54 PM, Quote, "Hey, DetHead - I found an interesting entry ... Not much there to go on, but weren't both of those businesses metioned owned by Drew & Kathleen? Suds Pub - Our attorneys have been advised that a contract purchase has been entered in by the purchaser and the action that was brought by Blue Lightning has been dismissed. Peterson's bar (drugs?) ILL Found on http://boards.courttv.com/ - 11-01-2007 03:43 AM posted by "tina99", Member, Registered: Jun 2007, Location:, Posts: 17 - "I know for a fact he did cheat on his wife who supposedly killed herself, I know "one" of the women he was having an affair with, and the bar that he did own, was filled with drugs and or drug dealing, and this was in the lets say 1994 1995 1996 years He always wanted me to go out with him, but I think he knew I was too smart for him I always kept kind of touch with him through the years later, but not too much, he got kind of quiet after that"
Charles Doman Tom Morphey managed the bar for Drew and Kathleen Peterson in the '90s ILL CHARLIE DOMAN, KATHLEEN SAVIO'S NEPHEW: "Thanks, Greta. Yes. Yes, I know Tom [Morphey]" - "I — he was actually the manager at the bar [Suds Pub] when I was a deejay." - "it was the bar that he [Drew] owned with my aunt [Kathleen Savio] at the time." - "Oh, I don't know, like, maybe eight, ten years ago, somewhere around there." - "Again, around my early 20s, around, you know, mid-'90s, around there somewhere, early '90s, mid-'90s. I didn't see him much after I quit working at the bar, a little here and there, but nothing — nothing special." - "I know at the time ['90s], he [Tom Morphey] was always worried about what Drew thought of him, what Drew would say if he did whatever. So Drew — drew was in his mind a lot when we'd be hanging out, and so on and so forth." - "It just seemed to me like the same old Tom. He used to get really wasted all the time." 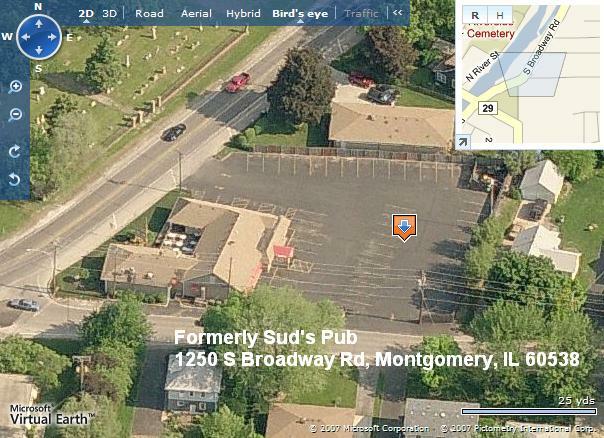 "Drew and Vicki owned Suds Pub in Montgomery, IL (now known as Elmers Dog house) in the late 80’s/early 90’s. It was a VERY popular hang out for the 20 something crowd. 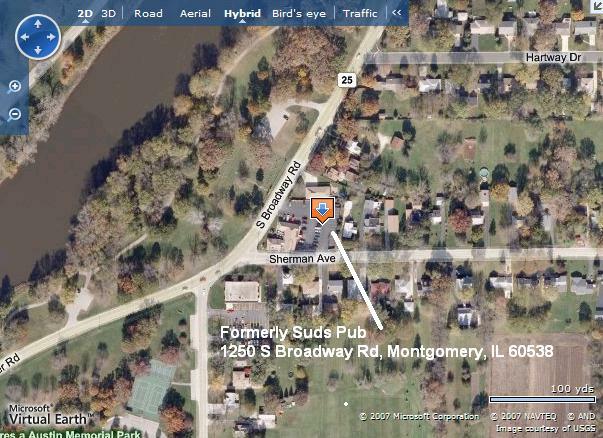 Montgomery is on the Fox River about 40 minutes N.W. of Bolingbrook. Drew seemed like a nice enough guy but did have the reputation of being overly friendly to the girls. Yes, there were drugs available. But not unlike any other similar bars in the area. Thank goodness you got out while you could Vicki." NOTE: This posting thread was deleted from the forum -- ILL Posted on www.findstacypeterson.com by "DetHead" Full Member, Posts: 641 on thread titled, "Re: Suds Pub" Reply #47 on: December 18, 2007, 12:12:38 AM, Quote, "Someone sent some info on this: Paul Peterson patented an invention-address was 9 clay..."
Applicant: PETERSON, Paul [US/US]; 9 Clay Court Montgomery, IL 60538 (US). Inventor: PETERSON, Paul [US/US]; 9 Clay Court Montgomery, IL 60538 (US). Agent: FLIGHT, James, A.; Marshall, Gerstein & Borun 6300 Sears Tower 233 South Wacker Drive Chicago, IL 60606 (US).